As Germany crash out in World Cup of shocks who would bet against an England win now? England boss Gareth Southgate last night admitted he was surprised to see Germany crash out of the World Cup but still refused to think the unthinkable of just a few weeks ago. Nevertheless England's increasing confidence of making a bigger tournament impact as they approach the last 16 has been boosted by the exit of the reigning world champions and the unconvincing group stages form of the more fancied nations. England arrived in Russia as no-hopers but in a World Cup full of surprises, they go into tonight's closing group game against Belgium comfortably qualified for the knockout stages and fearing no-one. 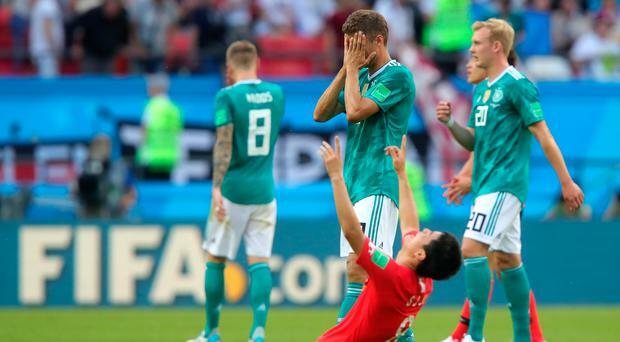 That mood was reinforced as Germany were eliminated following a 2-0 defeat to South Korea that saw Joachim Low's side finish bottom of Group F with Mexico and Sweden progressing. The early knockout is Germany's worst World Cup result since 1938 and, although Southgate said it came as a shock to see the four-time winners sent packing, he believes it shows just how good the teams in Russia are and the levelling of the playing field. "Of course I am surprised," he said of both the defeat and the fact that the Germans are heading home after the group stage. "I watched some of the game and they were just unable to break South Korea down." Southgate also said Germany's exit does not impact on England, even though the sides could have met in the quarter-final. "I don't think it has any bearing on us," he added. England will play either Senegal, Japan or Colombia in the last 16, depending on today's results. Brazil claimed their place in a 2-0 win over Serbia last night, along with Northern Ireland's play-off conquerors Switzerland who drew 2-2 with Costa Rica.